The Grand Rapids police department has placed one of its senior commanders on administrative leave. The city says it’s reviewing the actions of GRPD captain Curt VanderKooi in a case that led to a U.S. citizen being detained by Immigration and Customs Enforcement. Jilmar Ramos-Gomez was detained for three days in December, and faced possible deportation. That’s even though he’s a U.S. citizen and a veteran who served in the war in Afghanistan. Ramos-Gomez was arrested by the GRPD in November for setting a small fire, and for trespassing onto the helicopter pad area at Spectrum Butterworth hospital in Grand Rapids. Ramos-Gomez’s family says he suffers from PTSD as a result of his war service. An internal affairs investigation released this week by GRPD found that VanderKooi was at home, off-duty, when he learned about Ramos-Gomez’s arrest while watching the local news. VanderKooi then reached out to a contact at Immigration and Customs Enforcement. “Could you please check his status?” VanderKooi asked. 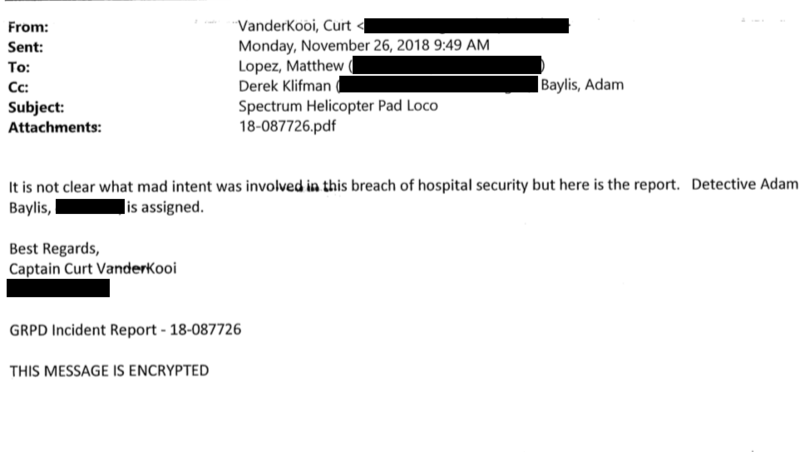 The internal affairs report concluded VanderKooi was justified in contacting ICE because he believed Ramos-Gomez’s actions could be related to a terrorism plot. That’s even though officers directly assigned to the case had already determined that wasn’t the situation. “Vet, PTSD. But not a FBI issue,” one GRPD officer texted to a contact at the FBI. Ramos-Gomez also had his U.S. passport in his backpack when he was arrested, which proved he was a citizen. This week, dozens of protesters interrupted a city commission meeting, and called for VanderKooi’s firing. This morning, city manager Mark Washington released a statement saying VanderKooi has been placed on administrative leave. A GRPD internal affairs report found Curt VanderKooi violated the department's policy on "discourtesy" when he used the word "loco" in this email, released earlier this week by the ACLU of Michigan. Jilmar Ramos-Gomez's family says he suffers from PTSD as a result of his combat service. But it’s not over the original contact with immigration authorities. Instead, it’s over the language VanderKooi used in a follow-email with ICE officers. VanderKooi used the word “LOCO” and the phrase “mad intent” in describing Ramos-Gomez’s actions. The GRPD internal affairs report concluded VanderKooi violated the police department’s policy on “discourtesy” when he used that language. Grand Rapids city manager Mark Washington says the city is now looking into whether VanderKooi was properly reprimanded for that discourtesy. Hillary Scholten is with the Michigan Immigrant Rights Center. She says the use of the word “loco” was not the only problem in this case. “And I think that’s a really important point because at this point, the Internal Affairs investigation has chosen to exonerate Captain VanderKooi for any action of wrongdoing related to his calling of ICE," she says. Scholten says she hopes today's steps are just the first steps in the process of dealing with the situation. "Right now our concern is making sure the rights of one of our members is being upheld," says Geoff Collard of the Grand Rapids Police Command Officers Association. But the union that represents VanderKooi says the city has already gone too far. "The re-opening of this case and the placement of Captain VanderKooi on Administrative leave is, in our opinion, a clear violation of the Due Process Rights of one of our members under our Collective Bargaining Agreement," the union said in a statement. Geoff Collard is with the Grand Rapids Police Command Officers Association. He says the union is open to discussing policy changes that would prevent a similar incident in the future. “But right now our concern is making sure the rights of one of our members is being upheld," he says. Washington says the results of that review will be shared in the coming weeks.